For those of you who aren’t familiar with Animal Fries, it’s one of the items in In-N-Out’s secret menu, which in reality, is not-so-secret to fans of this West Coast fast food star. The curious thing about In-N-Out is that they only have four items in their normal menu. Four! Compared to the different burger permutations of big-time fast food conglomerates such as McDonald’s and Burger King, In-N-Out thrives on the following: Hamburgers, Cheeseburgers, Double-Doubles, and French Fries. Beverages comprise of the standard Coca-Cola and the three standard milkshakes (vanilla, strawberry, and chocolate). It’s a quirky little gig of In-N-Out’s to have a secret menu containing more items than their regular menu has. Their “2-by-4” is a double take on their cheeseburger, with four slices of American cheese. If you’re vegetarian, you can opt for their “Grilled Cheese”, which is their standard cheeseburger—minus the burger. Or if you’re a full-on carnivore, try their “Flying Dutchman”, which uses burgers for buns and two slices of cheese in the middle, while their “Protein Style” is a bun-less burger if you want a carb-less lunch. Other interesting sides in the In-N-Out secret menu are their fries, which you can have “Light” for that raw potato taste, or “Well Done” if you want them extra crunchy. Their “Neapolitan Shake” is all three milkshake flavors whisked together, whereas their “Tea-Aid” is a marriage of Iced-Tea and Lemonade. They also have such a thing as “Lemon-Up” which is Lemonade and 7-Up. The secret sauce that In-N-Out uses in their burgers is known as “The Spread,” which is almost like a thousand-island dressing in terms of taste. 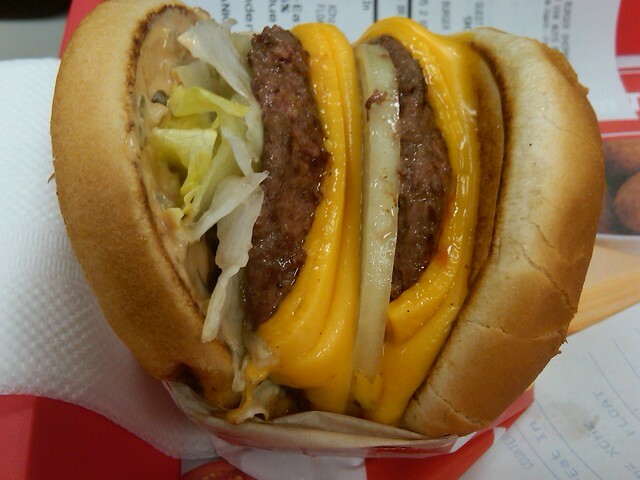 In-N-Out’s most famous burger is the “Animal Style” burger that doubles on the condiments such as pickles, cheese, and grilled onions, all mixed together on the grill before dumping them on your burger. Animal Fries are the potato version of this. In-N-Out’s Animal Fries originally contain a massive amount of melted cheese, grilled onions, and a heaping ladle of “The Spread”. Our version of these artery-clogging fries contains cheddar cheese, caramelized onions, and Thousand Island dressing. Oh, and we also added some sour cream and deep-fried bacon bits. Someday, I wish that In-N-Out would find its way to the Philippines so that I can cradle a legit Flying Dutchman in my arms. But for now, these Animal Fries will be more than enough to keep me fat company until that day comes. Melt butter in pan and cook the chopped onions over low flame for 30-40 minutes. Heat in pan over low flame until melted and combined. Fry potatoes over low flame until cooked but still pale, around 3-5 minutes. Drain and cool down for 10 minutes. Crank up the flame until smokey and flash fry potatoes until crispy and golden brown. love in n out! i wish they come to the philippines too! Such a heartbreaker, but you still end up daydreaming about it. Can’t find sour cream in my local grocery. Where can you buy it and which brand do you recommend? What cream can I use for the cheese sauce?